Habitat: Live in the forest near the coast but can be found in the beach during beginning of summer and autumn. 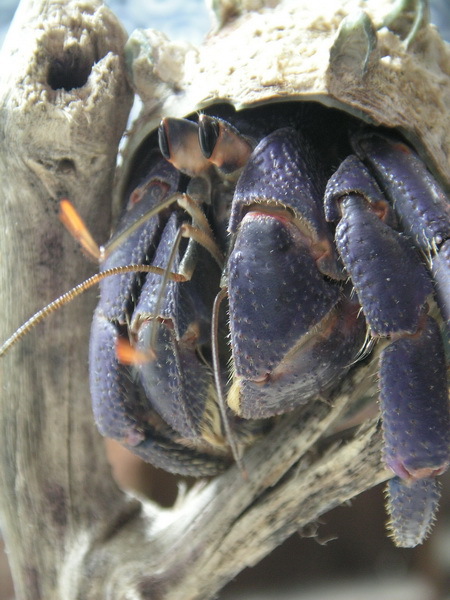 Characteristics: Coenobita purpureus (colloquially referred to as the purple land hermit crab) is a species of land hermit crab native to Japan. Dubbed ‘Blueberry’ crabs by Felix Wang. Their coloration is usually purple, blue, purple-blue, or purple-red although as young crabs they are colored white. 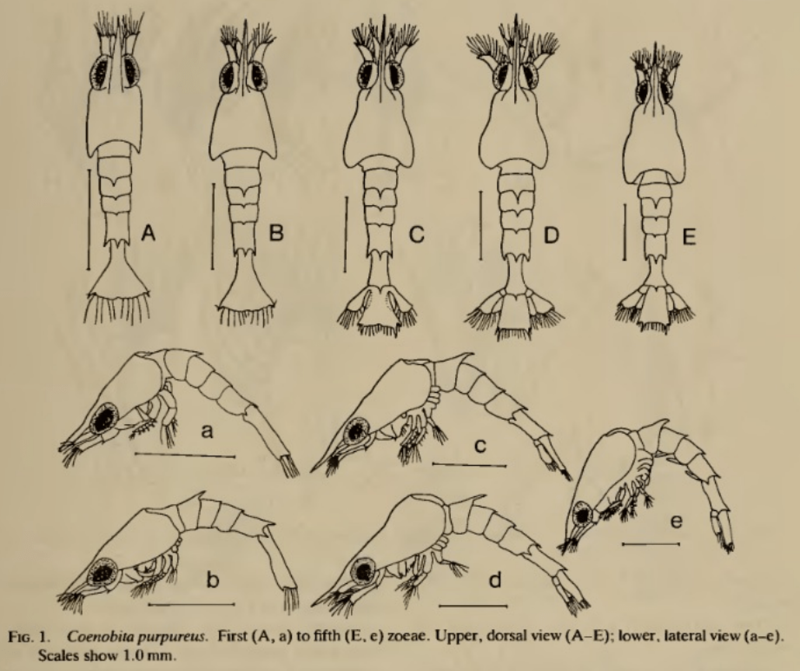 Their eyestalks are long and their eyes are oval in shape. The joints of their pincers and walking legs are yellow and the abdomen is short and fat. They can be 17mm in length. They live in the forest near the coast and can be found near the beach in the beginning of summer and in autumn. Body colour can be from light blue to dark purple. Most of them are Purple-blue, Purple, Blue and Purple-Red etc. They were in white colour when they are juvenile, and will become blue or purple when they grow up. Eyes are elongated in shape and there are a yellow stripes surround the eyes . Eyestalks are white / light yellow in colour. Generally, there is no black-brown stripes on the eyestalksbut there are also some exceptional case. Tips of the 1st pair of antenna is red. The bottom of the 2nd pair of antenna is white in colour. Antennal acicle cannot move, fused with second segment of its peduncle. Left claw is larger than right claw. There are 4~5 ridge (////) on the upper part of the big claw (Red circle). There are some hair on the inside part of both claws. The joint of claw is yellow in colour and have filiform red colour on the joint. The joint of walking legs is also yellow in colour and have filiform red colour on the joint. The last 2nd part (dactylus & propodus) of their 3rd left Walking legs is not flat. According to the articles of Akira Asakura (Japan Natural History Museum and Institute, Chiba) and Yukio Nakasone (University of the Ryukyus), outer surface of propodus of left 3rd leg separated from dorsal surface by a well-marked longitudinal crest. It is believed that they were in cream colour when they are juvenile, and will become blue when they grow up. Shield narrower anteriorly, strongly swollen just behind front; dorsal surface with numerous scattered granules on anterior, posterior and lateral portions; lateral margins of the shield with setae. Ocular peduncle compressed and reaching nearly to median part of ultimate segment of antennnal peduncle. Small flagellum of antennule reaching nearly to median part of the large one. Antennal acicle fused with second segment of its peduncle. Palm of left cheliped with an oblique series of up-standing four to five laminar teeth on upper part of outer surface; upper portion of pal with numerous scattered granules on than oblique teeth on outer surface, but lower portion with small granules and nearly smooth; both fingers with scattered granules on outer surface. In left third leg outer surfaces of dactylus and propodus smooth, separated from dorsal surfaces by a well-marked longitudinal crest; outer surface of propodus not flat, but slightly swollen in midline. 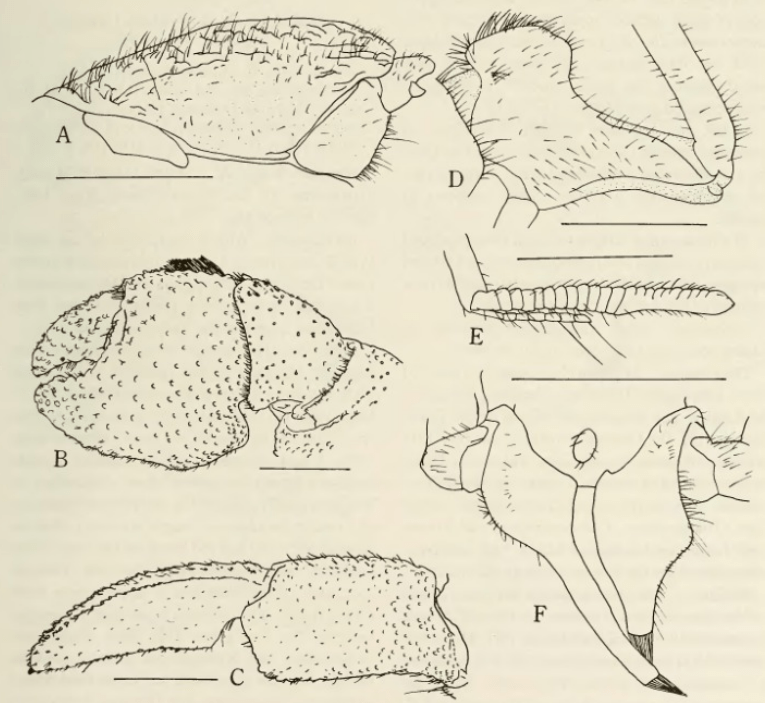 In male coxae of fifth legs of both sides produced ventrally, unequal and right coxa produced into an elongate tube, usually longer than left one; its tube turning to the left and curved ventrally. Small individuals generally of cream color and large ones of blue color. Eyes – Elongated, stalks are generally just white. Often a orange/yellow border around the cornea. Preferred shells: purpureus juvenile prefer neritina and other brackishwater shells and marine algae snail shells. Mature purpureus prefers achatina shells. Special Thanks to Nick Bay, Felix Wang and Tony Coenobita for their photos and information regarding purpureus, Christian Bockenauer of Triops Germany for the videos.